The Jaguar F-Type is no longer the sports car story in America. It’s been on sale for six months, 1843 have been sold. Whatever. 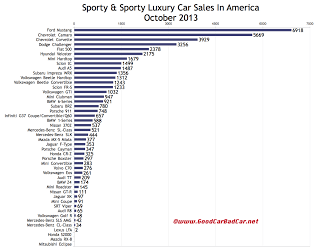 The fact that Porsche’s Cayman outsold Porsche’s own Boxster is not America’s leading sports car story in October. This was the third time the Cayman has accomplished this feat since arriving in America in 981 form in April. Ford’s Mustang outsold the Chevrolet Camaro in October. That didn’t put the Mustang over the top in the year-to-date standings, but it brought it within 4401 units of the leading pony car. However, this isn’t our headline, either. 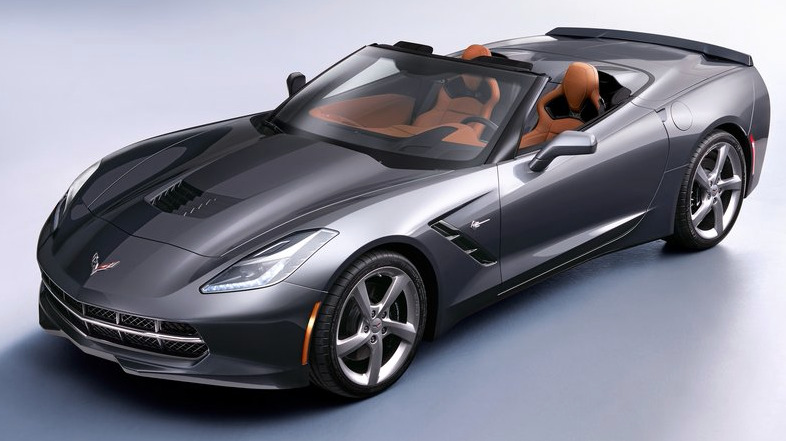 You see, Chevrolet’s seventh-generation Corvette arrived in showrooms in October 2013. 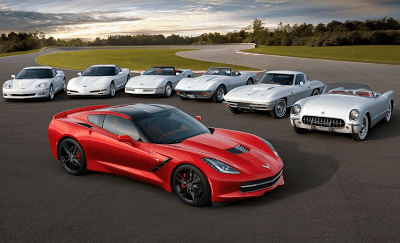 And the Corvettes that arrived in showrooms were promptly driven out of showrooms, not just on test drives, but on drives that would take the Corvettes to driveways and garages across America. 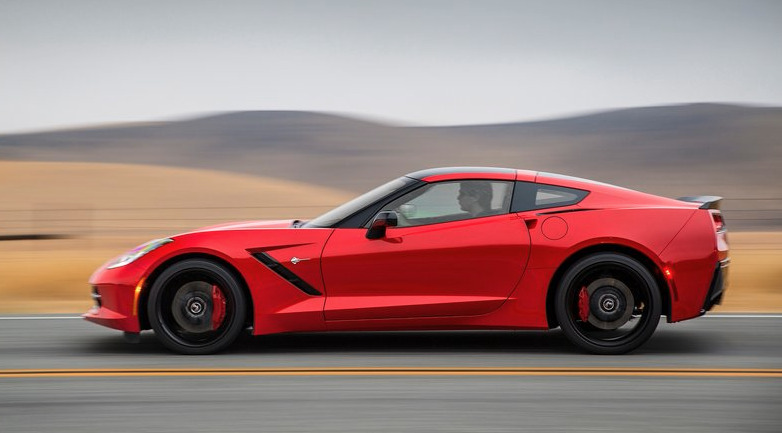 Corvette volume more than tripled in October, rising 237%, or 2762 units. 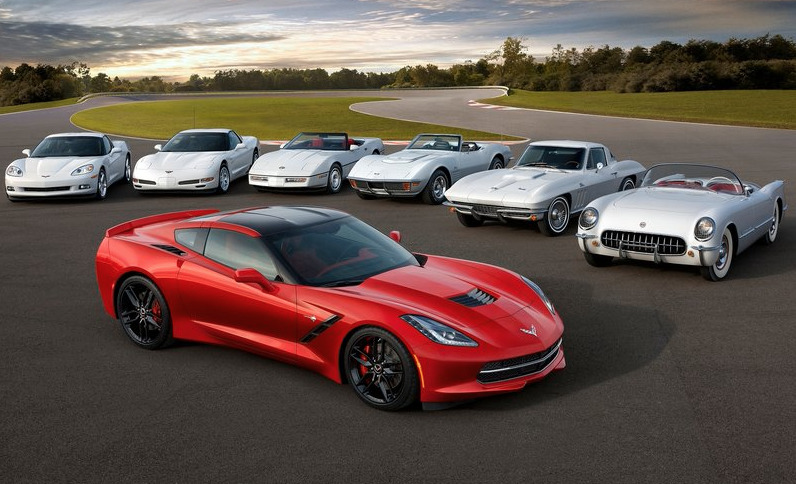 True, for the most part, the Corvette and Viper compete in slightly different markets. The Corvette verges on affordability; the Viper does not. But if you were an automaker, if you could morph into General Motors or the Chrysler Group, wouldn’t you want to be selling the $51,000-$67,800 car (before options and hi-po derivatives arrive) that has the potential to generate 3929 sales in a single month than the car which, while listed at $102,485, hardly generates two sales per day? Dodge sold 2103 Vipers in the United States in 2003. They’ll be lucky to sell 700 in 2013. It’s not as though General Motors is selling Corvettes the way they used to: more than 30,000 were sold in 2002, 2004, 2005, 2006, and 2007. Even with repeats of October, Chevrolet won’t sell 20,000 in 2013. But it’s certainly shaking its money maker. You can click any model name in the tables below to find historical monthly and yearly U.S. auto sales data. You can also select a make and model at GCBC’s Sales Stats page. These tables are now sortable, so you can rank sports cars, roadsters, coupes, and muscle cars any which way you like. Suggestions on how GCBC should break down segments can be passed on through the Contact page. The + icon has been removed from year-over-year improvements. Look for red font to designate year-over-year declines. When BMW USA begins reporting 4-Series sales figures outside of the 3-Series’ total – as BMW Canada has already done – we’ll display the 4-Series here. Clearly GoodCarBadCar is not suggesting that the cars in the two tables above are all direct competitors. Establishing categories among cars as unique as even the Audi TT and Porsche Boxster has never pleased a single reader, so cars have been lumped together so you can simply see how buyers looking for sports cars, roadsters, hot hatches, convertibles, GTs, and wanna-be sports cars spend their money. Greater categorization of cars would only lead to problems that automakers create by not isolating model-specific sales figures: we don’t know how many M3s BMW has sold or how many Civics are Si models, for example. The numbers we do have are listed above. GoodCarBadCar is always open to hearing about the ways you would break down segments, so feel free to get in touch. Sales data for brands such as Aston Martin, Ferrari, Lamborghini, Lotus, Maybach, Rolls-Royce etc. are unfortunately not broken down by model. estimates say sales for those brands in the first ten months of 2013 were 690, 1620, 460, 220, zero, and 840, respectively. Bentley has sold 2199 cars so far this year. Maserati has sold 2828 cars. 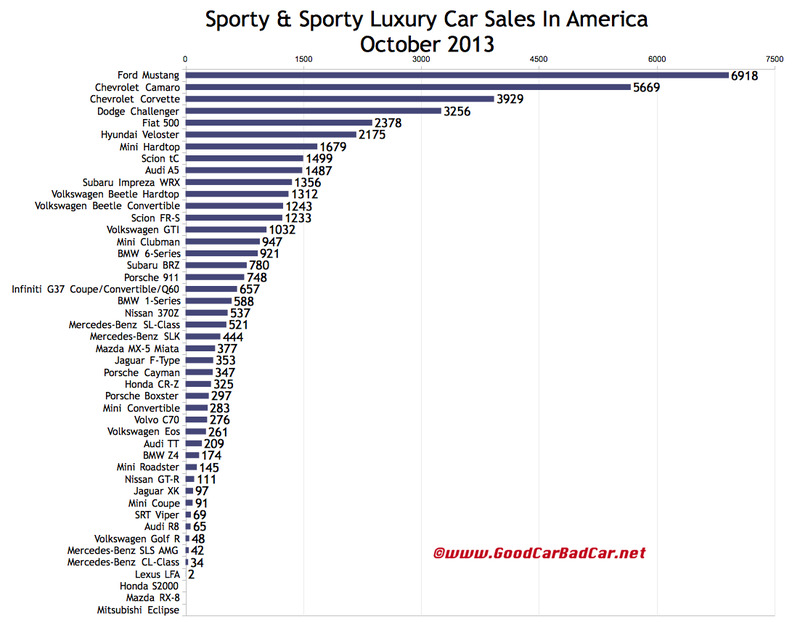 Reportedly, Tesla had risen to 15,550 through ten months with 1300 October sales. Tesla, unfortunately, doesn’t release model-specific monthly U.S. sales data.